My interest in human prehistory goes back to the early 1990s, when I read Jared Diamond’s classic The Third Chimpanzee. Prior to this, I had been more interested in the future than the distant past and I had been an avid reader of books by Arthur C. Clarke, Brian Aldiss and Isaac Asimov since my childhood. Much later, I discovered Olaf Stapledon’s future history, Last and First Men, with its breath-taking vision of 18 successive human species, all very different from Homo sapiens yet, ultimately, sharing much of what makes us human. I was intrigued by the realisation that in reality, Homo sapiens are not the “First Men”. We were preceded by many other hominins (to use the technical term), including Australopithecus, Homo erectus and the Neanderthals, all now extinct. What would it have been like to have lived in a time when there was more than one human species in existence? What were these other people like and how did they live? I first thought of writing a book about human prehistory in the summer of 2003, though the idea of earning my living as a writer goes back quite a bit further. My father, Jack Seddon, was a successful screenwriter. Beginning in the 1950s, he and his long-standing business partner David Pursall formed a prolific screenwriting partnership which endured for almost three decades. Much of their oeuvre was comedy, but their credits include two 1960s war movies, the all-star D-Day epic The Longest Day and The Blue Max, which starred George Peppard as maverick German WWI fighter ace Bruno Stachel. Their comedy output included screen adaptations of many of the works of Agatha Christie, starring Margaret Rutherford. But Agatha Christie had never intended her books to be turned into comedy-thrillers and apparently failed to see the joke! My own efforts had up to then been less successful. In the twenty year period between 1980 and 2000, I wrote two novels. The first garnered encouraging noises from an agent and a flicker of interest from one or two publishers, but in the end nothing came of it. I self-published the second, but it failed to make much headway. Self-publishing had yet to come of age with eBooks and print-on-demand technology. 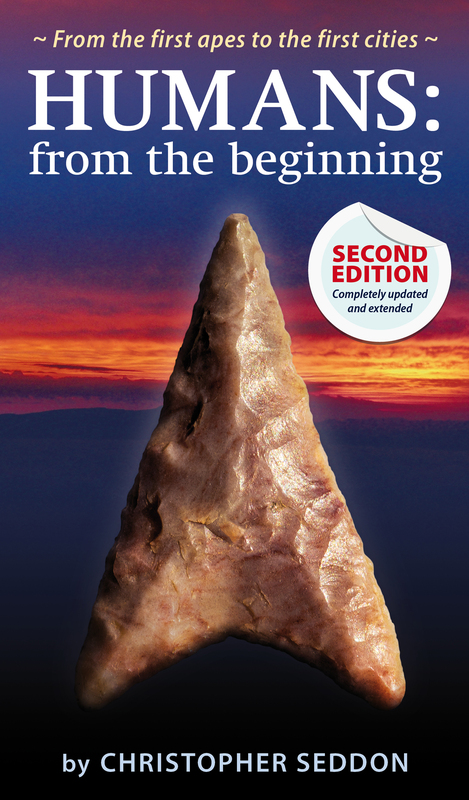 Having decided to turn to writing non-fiction, human prehistory was an obvious choice, but it is a vast field. Furthermore, it is one in which I have no formal background. My degree, gained many years ago, is in the natural sciences and my knowledge at that time was little more than that of an informed layman. Where to start? The answer, in the first instance, was to read. In addition to hard knowledge, I hoped ideas would eventually come to me about which area I should focus on. I soon realised that for all volumes of literature devoted to archaeology and anthropology, something was missing: a single-volume work tackling the entire human past from the first apes to the first cities. I felt that such a book should be written for the non-specialist, while at the same time be sufficiently comprehensive in scope, rigorous in content, and well-referenced to be regarded as serious contribution to the field. Works I regarded as exemplars of the type of book I was attempting to write include Out of Eden by Stephen Oppenheimer and After the Ice by Steven Mithen. By the spring of 2009, the project had occupied me for almost six years. During this time, I had become considerably more knowledgeable about the subject, but I still had only vague ideas as to how I might set about encompassing the whole subject, from the earliest ape-like hominins to the rise of civilization. Part of the problem, of course, was the day-job. Even a job that does not demand too great a commitment in terms of overtime is not conducive to a project like this and even my two novels – which required far less in the way of research – had both required many years to complete. One important thing I had done during this phase was to start a blog. It was fairly eclectic and apart from prehistory, it covered many fields from movies to architecture. Its main purpose, though, was to get me into the habit of writing again. It was at this point – just months after the financial crisis almost brought about the collapse of the world’s banking system – when I was made redundant by the small computer consultancy for which I worked. It was hardly a surprise: the company’s main line of business was mortgage systems for subprime lenders, and this was now not exactly a growth area. I had at that point been working in IT for over thirty years, much of it at a large international law firm, but my lengthy stay there was eventually ended by a departmental restructuring. Faced with a second redundancy in two years, I decided it was time for a complete change of direction and that I was going to work full time on my book. Newly-unemployed in the middle of the worst recession since the 1930s, I realised that I had a choice – either I could look for another IT job, or I could do something else entirely. The first option would simply entail carrying on as before, probably after a lengthy period of unemployment in what was a very tough job market. Frankly, it didn’t sound terribly interesting. When I looked at my finances, I realised that while I wasn’t in a position to retire comfortably, I could afford to take a career break for however long I needed – within reason – to write my book. While there was an element of risk, it was a no-brainer. Humans: from the beginning took me five years to complete, during which time there were some headline-making discoveries. In 2009, there was still no strong evidence that modern humans had interbred with Neanderthals. The enigmatic Denisovans – an archaic human species that apparently also interbred with modern humans – had yet to be discovered, as had Australopithecus sediba, a South African species that might be the direct ancestor of the first humans. Many long-established scholarly paradigms have been called into question by recent findings. Such discoveries are widely reported in the media, reflecting the level of public interest in our origins and our past. Human evolution and prehistory are now a fast-moving and dynamic fields, which is one of the things that make them so interesting.